Costanza, R et al. (1997) The value of the world’s ecosystem services and natural capital. Nature, 387(6630), 253-260. Paine, RT et al. (1998) Compounded perturbations yield ecological surprises. Ecosystems, 1(6), 535-545. Turner, MG et al. (1998) Factors influencing succession: Lessons from large, infrequent natural disturbances. Ecosystems, 1(6), 511-523. Fagan, WE et al. (1999) How habitat edges change species interactions. American Naturalist, 153(2), 165-182. Williamson, M (1999) Invasions. Ecography, 22(1), 5-12. Grimm, NB et al. (2000) Integrated approaches to long-term studies of urban ecological systems. Bioscience, 50(7), 571-584. Clark, JS et al. (2001) Ecological forecasts: An emerging imperative. Science, 293(5530), 657-660. Jackson, JBC et al. (2001) Historical overfishing and the recent collapse of coastal ecosystems. Science, 293(5530), 629-638. Tilman, D et al. (2001) Forecasting agriculturally driven global environmental change. Science, 292(5515), 281-284. Boyer, EW et al. (2002) Anthropogenic nitrogen sources and relationships to riverine nitrogen export in the north- eastern USA. Biogeochemistry, 57(1), 137-169.
de Groot, RS et al. (2002) A typology for the classification, description and valuation of ecosystem functions, goods and services. Ecological Economics, 41(3), 393-408. Karl, D et al. (2002) Dinitrogen fixation in the world’s oceans. Biogeochemistry, 57(1), 47-98. Schenk, HJ and RB Jackson (2002) Rooting depths, lateral root spreads and below-ground/above-ground allometries of plants in water-limited ecosystems. Journal of Ecology, 90(3), 480-494. Tilman, D et al. (2002) Agricultural sustainability and intensive production practices. Nature, 418(6898), 671-677. Wiens, JA (2002) Riverine landscapes: taking landscape ecology into the water. Freshwater Biology, 47(4), 501-515. McClain, ME et al. (2003) Biogeochemical hot spots and hot moments at the interface of terrestrial and aquatic ecosystems. Ecosystems, 6(4), 301-312. Pandolfi, JM et al. (2003) Global trajectories of the long-term decline of coral reef ecosystems. Science, 301(5635), 955- 958. Peterson, AT (2003) Predicting the geography of species’ invasions via ecological niche modeling. Quarterly Review of Biology, 78(4), 419-433. Suding, KN et al. (2004) Alternative states and positive feedbacks in restoration ecology. Trends in Ecology & Evolution, 19(1), 46-53. Bernhardt, ES et al. (2005) Ecology – Synthesizing US river restoration efforts. Science, 308(5722), 636-637. Palmer, MA et al. (2005) Standards for ecologically successful river restoration. Journal of Applied Ecology, 42(2), 208-217. Lotze, HK et al. (2006) Depletion, degradation, and recovery potential of estuaries and coastal seas. Science, 312(5781), 1806-1809. Orth, RJ et al. (2006) A global crisis for seagrass ecosystems. Bioscience, 56(12), 987-996. Elser, JJ et al. (2007) Global analysis of nitrogen and phosphorus limitation of primary producers in freshwater, marine and terrestrial ecosystems. Ecology Letters, 10(12), 1135-1142. Klein, AM et al. (2007) Importance of pollinators in changing landscapes for world crops. Proceedings of the Royal Society B-Biological Sciences, 274(1608), 303-313. Halpern, BS et al. (2008) A global map of human impact on marine ecosystems. Science, 319(5865), 948-952. Waide, RB et al. (1999) The relationship between productivity and species richness. Annual Review of Ecology and Systematics, 30, 257-300. Chesson, P (2000) Mechanisms of maintenance of species diversity. Annual Review of Ecology and Systematics, 31, 343-366. Sala, OE et al. (2000) Global biodiversity scenarios for the year 2100. Science, 287(5459), 1770-1774. Loreau, M et al. 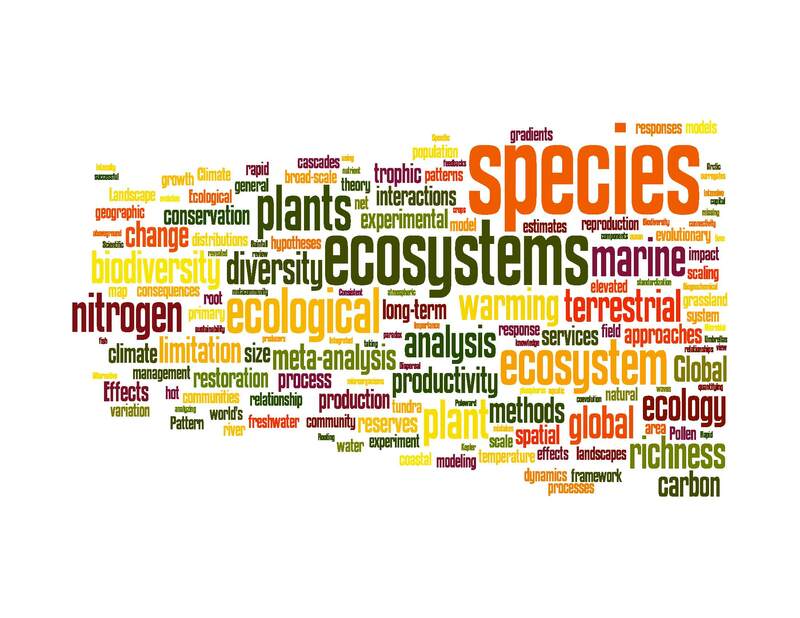 (2001) Biodiversity and ecosystem functioning: Current knowledge and future challenges. Science, 294(5543), 804-808. Mittelbach, GG et al. (2001) What is the observed relationship between species richness and productivity? Ecology, 82(9), 2381-2396. Tilman, D et al. (2001) Diversity and productivity in a long-term grassland experiment. Science, 294(5543), 843-845. Whittaker, RJ et al. (2001) Scale and species richness: towards a general, hierarchical theory of species diversity. Journal of Biogeography, 28(4), 453-470. Hawkins, BA et al. (2003) Energy, water, and broad-scale geographic patterns of species richness. Ecology, 84(12),3105-3117. Willig, MR et al. (2003) Latitudinal gradients of biodiversity: Pattern, process, scale, and synthesis. Annual Review of Ecology Evolution and Systematics, 34, 273-309. Currie, DJ et al. (2004) Predictions and tests of climate-based hypotheses of broad-scale variation in taxonomic richness. Ecology Letters, 7(12), 1121-1134. Moore, JC et al. (2004) Detritus, trophic dynamics and biodiversity. Ecology Letters, 7(7), 584-600. Rodrigues, ASL et al. (2004) Effectiveness of the global protected area network in representing species diversity. Nature, 428(6983), 640-643. Worm, B et al. 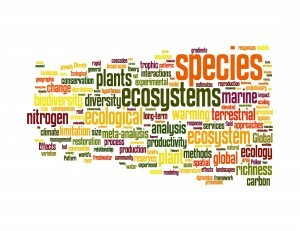 (2006) Impacts of biodiversity loss on ocean ecosystem services. Science, 314(5800), 787-790. Jackson, RB et al. (1997) A global budget for fine root biomass, surface area, and nutrient contents. Proceedings of the National Academy of Sciences of the United States of America, 94(14), 7362-7366. Curtis, PS and XZ Wang (1998) A meta-analysis of elevated CO(2) effects on woody plant mass, form, and physiology. Oecologia, 113(3), 299-313. Arft, AM et al. (1999) Responses of tundra plants to experimental warming: Meta-analysis of the international tundra experiment. Ecological Monographs, 69(4), 491-511. Parmesan, C et al. (1999) Poleward shifts in geographical ranges of butterfly species associated with regional warming. Nature, 399(6736), 579-583. Chapin, FS et al. (2000) Arctic and boreal ecosystems of western North America as components of the climate system. Global Change Biology, 6, 211-223. Easterling, DR et al. (2000) Climate extremes: Observations, modeling, and impacts. Science, 289(5487), 2068-2074. Shaver, GR et al. (2000) Global warming and terrestrial ecosystems: A conceptual framework for analysis. Bioscience, 50(10), 871-882. Pacala, SW et al. (2001) Consistent land- and atmosphere-based US carbon sink estimates. Science, 292(5525), 2316- 2320. Rustad, LE et al. (2001) A meta-analysis of the response of soil respiration, net nitrogen mineralization, and above ground plant growth to experimental ecosystem warming. Oecologia, 126(4), 543-562. Goodale, CL et al. (2002) Forest carbon sinks in the Northern Hemisphere. Ecological Applications, 12(3), 891-899. Harvell, CD et al. (2002) Climate warming and disease risks for terrestrial and marine biota. Science, 296(5576), 2158-2162. Knapp, AK et al. (2002) Rainfall variability, carbon cycling, and plant species diversity in a mesic grassland. Science, 298(5601), 2202-2205. Luo, Y et al. (2004) Progressive nitrogen limitation of ecosystem responses to rising atmospheric carbon dioxide. Bioscience, 54(8), 731-739. Thomas, CD et al. (2004) Extinction risk from climate change. Nature, 427(6970), 145-148. Gurevitch, J and LV Hedges (1999) Statistical issues in ecological meta-analyses. Ecology, 80(4), 1142-1149. Hedges, LV et al. (1999) The meta-analysis of response ratios in experimental ecology. Ecology, 80(4), 1150-1156. Sork, VL et al. (1999) Landscape approaches to historical and contemporary gene flow in plants. Trends In Ecology & Evolution, 14(6), 219-224. Clark, DA et al. (2001) Measuring net primary production in forests: Concepts and field methods. Ecological Applications, 11(2), 356-370. Reich, PB et al. (2001) Plant diversity enhances ecosystem responses to elevated CO2 and nitrogen deposition. Nature, 410(6830), 809-812. Urban, D and T Keitt (2001) Landscape connectivity: A graph-theoretic perspective. Ecology, 82(5), 1205-1218. Dungan, JL et al. (2002) A balanced view of scale in spatial statistical analysis. Ecography, 25(5), 626-640. Legendre, P et al. (2002) The consequences of spatial structure for the design and analysis of ecological field surveys. Ecography, 25(5), 601-615. Post, (DM2002) Using stable isotopes to estimate trophic position: Models, methods, and assumptions. Ecology, 83(3), 703-718. Anderson, RP et al. (2003) Evaluating predictive models of species’ distributions: criteria for selecting optimal models. Ecological Modelling, 162(3), 211-232. Christensen, V and CJ Walters (2004) Ecopath with Ecosim: methods, capabilities and limitations. Ecological Modelling, 172(4-Feb), 109-139. Graham, CH et al. (2004) New developments in museum-based informatics and applications in biodiversity analysis. Trends in Ecology & Evolution, 19(9), 497-503. Elith, J et al. (2006) Novel methods improve prediction of species’ distributions from occurrence data. Ecography, 29(2), 129-151. Ludascher, B et al. (2006) Scientific workflow management and the Kepler system. Concurrency and Computation- Practice & Experience, 18(10), 1039-1065. Selkoe, KA and RJ Toonen (2006) Microsatellites for ecologists: A practical guide to using and evaluating microsatellite markers. Ecology Letters, 9(5), 615-629. Clark, JS et al. (1998) Reid’s paradox of rapid plant migration – Dispersal theory and interpretation of paleoecological records. Bioscience, 48(1), 13-24. Thompson, JN (1998) Rapid evolution as an ecological process. Trends in Ecology & Evolution, 13(8), 329-332. Thompson, JN (1999) Specific hypotheses on the geographic mosaic of coevolution. American Naturalist, 153, S1-S14. Crandall, KA et al. (2000) Considering evolutionary processes in conservation biology. Trends in Ecology & Evolution, 15(7), 290-295. Alroy, J et al. (2001) Effects of sampling standardization on estimates of Phanerozoic marine diversification. Proceedings of the National Academy of Sciences of the United States of America, 98(11), 6261-6266. Webb, CO et al. (2002) Phylogenies and community ecology. Annual Review of Ecology and Systematics, 33, 475-505. Bininda-Emonds, ORP et al. (2007) The delayed rise of present-day mammals. Nature, 446(7135), 507-512. Bjornstad, ON et al. (1999) Spatial population dynamics: Analyzing patterns and processes of population synchrony. Trends in Ecology & Evolution, 14(11), 427-432. Enquist, BJ et al. (1999) Allometric scaling of production and life-history variation in vascular plants. Nature, 401(6756), 907-911. Goldberg, DE et al. (1999) Empirical approaches to quantifying interaction intensity: Competition and facilitation along productivity gradients. Ecology, 80(4), 1118-1131. Pace, ML et al. (1999) Trophic cascades revealed in diverse ecosystems. Trends in Ecology & Evolution, 14(12), 483- 488. Elser, JJ et al. (2000) Nutritional constraints in terrestrial and freshwater food webs. Nature, 408(6812), 578-580. Enquist, BJ and KJ Niklas (2001) Invariant scaling relations across tree-dominated communities. Nature, 410(6829), 655-660. Gillooly, JF et al. (2001) Effects of size and temperature on metabolic rate. Science, 293(5538), 2248-2251. West, GB et al. (2001) A general model for ontogenetic growth. Nature, 413(6856), 628-631. Callaway, RM et al. (2002) Positive interactions among alpine plants increase with stress. Nature, 417(6891), 844-848. Gillooly, JF et al. (2002) Effects of size and temperature on developmental time. Nature, 417(6884), 70-73. Gotelli, NJ and DJ McCabe (2002) Species co-occurrence: A meta-analysis of J. M. Diamond’s assembly rules model. Ecology, 83(8), 2091-2096. Kelly, D and VL Sork (2002) Mast seeding in perennial plants: Why, how, where? Annual Review of Ecology and Systematics, 33, 427-447. Shurin, JB et al. (2002) A cross-ecosystem comparison of the strength of trophic cascades. Ecology Letters, 5(6), 785- 791. Werner, EE and SD Peacor (2003) A review of trait-mediated indirect interactions in ecological communities. Ecology, 84(5), 1083-1100. Ashman, TL et al. (2004) Pollen limitation of plant reproduction: Ecological and evolutionary causes and consequences. Ecology, 85(9), 2408-2421. Leibold, MA et al. (2004) The metacommunity concept: a framework for multi-scale community ecology. Ecology Letters, 7(7), 601-613. Knight, TM et al. (2005) Pollen limitation of plant reproduction: Pattern and process. Annual Review of Ecology Evolution and Systematics, 36, 467-497. Martiny, JBH et al. (2006) Microbial biogeography: putting microorganisms on the map. Nature Reviews Microbiology, 4(2), 102-112. Grenfell, BT et al. (2001) Travelling waves and spatial hierarchies in measles epidemics. Nature, 414(6865), 716-723. Mitchell, CE and AG Power (2003) Release of invasive plants from fungal and viral pathogens. Nature, 421(6923), 625-627. Torchin, ME et al. (2003) Introduced species and their missing parasites. Nature, 421(6923), 628-630. Andelman, SJ and WF Fagan (2000) Umbrellas and flagships: Efficient conservation surrogates or expensive mistakes? Proceedings of the National Academy of Sciences of the United States of America, 97(11), 5954-5959. Beck, MW et al. (2001) The identification, conservation, and management of estuarine and marine nurseries for fish and invertebrates. Bioscience, 51(8), 633-641. Halpern, BS and RR Warner (2002) Marine reserves have rapid and lasting effects. Ecology Letters, 5(3), 361-366. Halpern, BS (2003) The impact of marine reserves: Do reserves work and does reserve size matter? Ecological Applications, 13(1), S117-S137.